If you wish to modify existing settings, please click here. Fill in your name, e-mail address and password. The e-mail address should be the one that you've already set up in cPanel and the password is the one you've already allocated with that. Click [Continue]. You may get one or two messages stating that Mail can't verify the identity of autodiscover.domain-name-here.co.uk or domain-name-here.co.uk - at this stage you can ignore these, and just click [Connect] to move on. Select the account type as POP. The description can be something that reminds you which account this relates to. 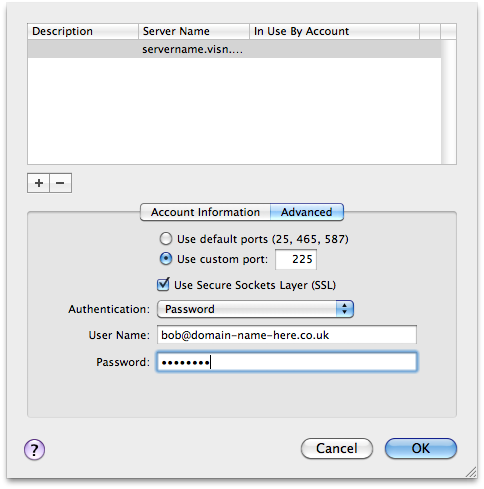 Fill in the Incoming Mail Server name (servername.visn.co.uk) from your instructions, and use the user name that you have set up in cPanel, with the password that you've allocated to that account. Click [Continue]. Fill in the Outgoing Mail Server name (servername.visn.co.uk) from your instructions, and make sure that the box for "Use Authentication" is ticked. Fill in the user name that you have set up in cPanel, with the password that you've allocated to that account. Click [Continue]. 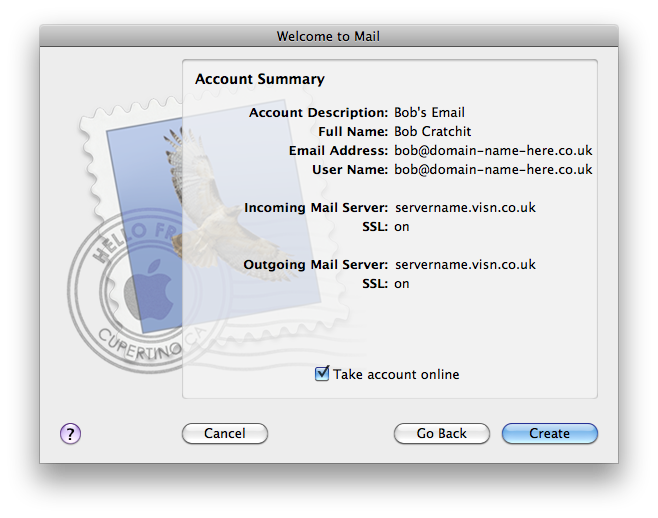 Check the information in the Account Summary, and make sure that the "Take account online" box is ticked, then click [Create] to add the account to Mac Mail. 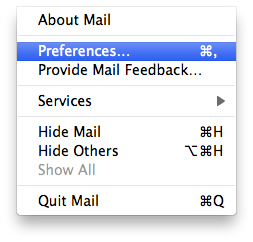 You will need to change the port used for outgoing email - to do this choose Preferences from the Mail menu bar. 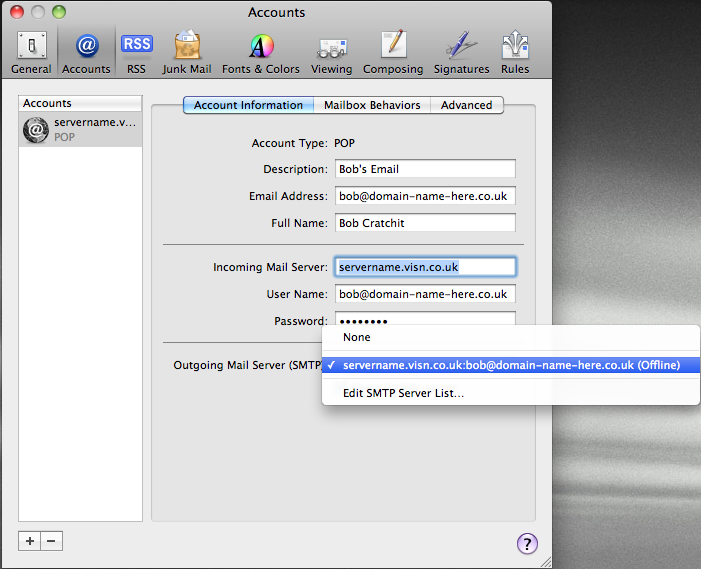 Click the drop-down button next to the Outgoing Mail Server (SMTP), and select the "Edit SMTP Server List..." option from this menu. Select the [Advanced] tab in the window that appears, and make sure that the "Use Secure Sockets Layer (SSL) is ticked. Also check that the Authentication type is set to Password, and that your user name and password are both present. Click the "Use custom port" radio button, and fill in the port number 225. Then click [OK] to continue. When you come to close the Accounts/Preferences window, you may be prompted to save the changes - click [Save] to do this. You should now be in a position to use your email account. The existing email setup will leave a copy of mail that you've already downloaded on the server hosting your account. This isn't a good idea in the longer term as you could eventually run out of space. You'll also find that email becomes slower to collect from a mailbox that has lots of mail already in it. Luckily, there is an option to remove mail from the server within Mac Mail. Go to Preferences > Accounts. Select the account in question, choose the Advanced tab, and there's an option for "Remove copy from server after retrieving a message" with a drop-down box. 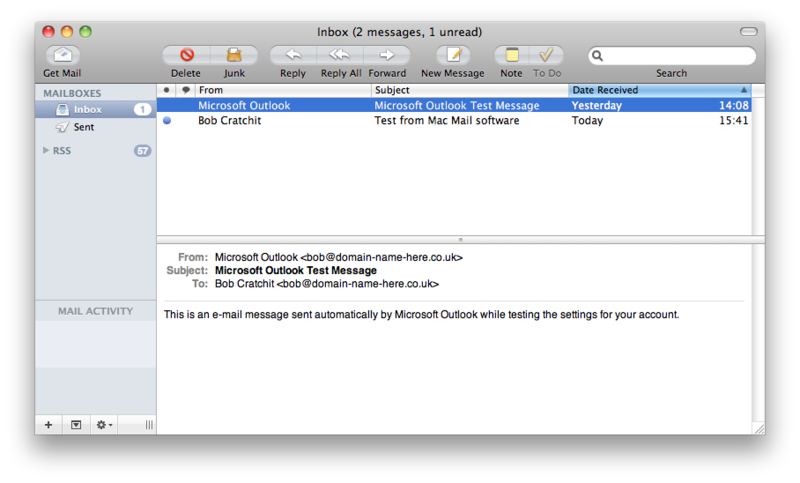 The options are - Immeditately; After One Day; After One Week; After One Month or When Removed From (local) Inbox. There's also a button for "Remove Now" if you need to manually flush the server's mail storage after you've downloaded. Copyright © 2013 Vision Internet Limited.